“I like Zapp not Zappa,” a Hot Chip member pronounces, backed by a down-pitched goblin version of himself, about two-thirds of the way through the gawky London party starters’ wiggly new dance-pop single, “Night and Day.” Although assuredly said with tongue at least halfway in cheek, it’s a statement that bears a little unpacking: Do two brainy wits with broad-minded record collections and considerable verge-of-the-mainstream renown really have that much less in common with an R&B-loving, ostensibly humorous, once-critically-acclaimed autodidact than with the Roger Troutman-fronted electro-soul outfit that helped inspire G-funk? Well, maybe so: Main songwriters Alexis Taylor and Joe Goddard’s best tracks, such as “Over and Over,” “The Boy From School,” and “Ready For the Floor,” boast populist hooks and heart-tugging themes with a potentially universal appeal that is, indeed, far more “California Love” than, uh, well, you know, those Zappa novelty hits he basically disavowed. 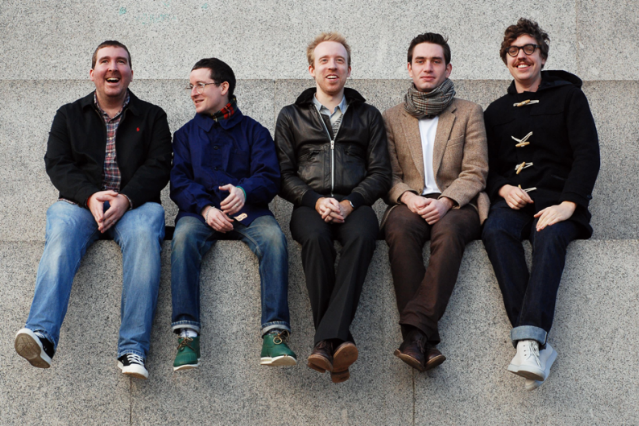 Thing is, Hot Chip have been mellowing on their last couple of albums, whether 2008’s Made in the Dark (which nevertheless had “Ready for the Floor,” “Shake a Fist,” and the beautifully Supermayer-remixed “One Pure Thought”) or 2010’s One Life Stand, which dialed back the band’s eccentricities and raised the strings-and-piano pomp levels only to reveal they could be, well, pretty sappy, too (“It’s a wild love I have for my brothers”; “I only wanna be your one life stand / Tell me will you stand by your man?”). Happily, “Night and Day” — presented here in its radio edit — has more in common with the fun-loving geek-funk of Hot Chip’s greatest songs, and it’ll surely inspire great audience dance-alongs on tour. And, yeah, it’s always been too easy to underestimate Hot Chip, because it feels like they’re generally thinking two trend shifts ahead. Still, for a group that reached the heights of 2006’s The Warning, “Night and Day” initially comes as a bit of a disappointment. From upcoming LP In Our Heads, the new single has a wonderfully limber bass line, a skittering drum track, and computer-lovin’ synths, but the basic conceit — something about “working” night and day, haha — combined with that spoken-word verse — “I don’t play no gabba,” we’re also told, which, sweet — gives the song a bit of a goofy, LCD Soundsystem cast-off aspect. The repeated title phrase, with what sounds like a female backing vocal, just might have enough earworm-y mania to break down our resistance by the time the album comes around on June 12, but we’ll have to wait and see. All that said, the previously posted In Our Heads cut “Flutes” is still a John Talabot-like Balearic banger. We’re keeping our hopes up.